I love checking out online math enhancement programs with my kids. The past few weeks, we have been using Math-Whizz from Whizz Education to supplement our curriculum. I’m such a math geek. I love math and enjoyed math in school. Several of my kids take after their dad and aren’t math fans. Since they have been trying out Math-Whizz for this review, they are actually asking to do more math! Math-Whizz is geared toward kids ages 5-13. With just 45 minutes a week of practice, the program can help accelerate your child’s learning. The program features over 1200 interactive and animated math lessons and games. Math-Whizz is fairly simple in concept. Once an account is created, kids log in for their placement test. This will give you your children’s approximate “math age” and gauge what areas need work. Once complete, my kids were able to start the “Tutor” section and begin to work. The tutoring is provided in game-like form, similar to the math games I remember doing as a kid. There is a parent login and individual logins for children. We used the program with my 12 year old son and 7 year old daughter. Both really enjoy the program and look forward to that time of day. I often find myself telling my son that it’s time to move along to something else. My 7 year old is currently in 2nd grade. She did struggle a bit with the program when it had her jump into multiplication. She hasn’t been taught it yet in our curriculum. I was able to sit down with her and us work on it together. She seems to be getting the hang of it now and I hope this makes it easier when it comes time to learn multiplication. After they work on concepts, I can login to the parent dashboard and see how they did. I can see what concept they worked on, if they needed help on something, and how long they worked. The little green arrow means that they did well and were able to “skip” the rest of the problems of that section since they did so well. The program will also email me if a child needs help on a concept. I really like that feature. As my children progressed, they were rewarded with credits to spend in the online “store” to play with in their login area. They were able to “buy” fish, toys, and other random items. This gave them the incentive needed to login each day and keep going. My son has a snake and is currently saving to buy a hamster. In the parent login, I can see where they are in compared to their average math age. The vertical green dotted line is the average. Gray is where they were when they started and the blue shows where they have improvement. It’s neat watching the change! I really like the Math-Whizz program, especially with the kids enjoying it and watching it enhance their math each day. We received a year of the program for the kids and I do believe we will renew it once we are finished. This program is available as a free trial with limited lessons or you can subscribe. Subscriptions are $12 a month for the first child and $9 for an additional child. You can also get a yearly subscription for $124 and additional children at $90. I feel this value is very fair considering your children get instant feedback and rewards based on their performance. To find out more, please visit Math-Whizz . 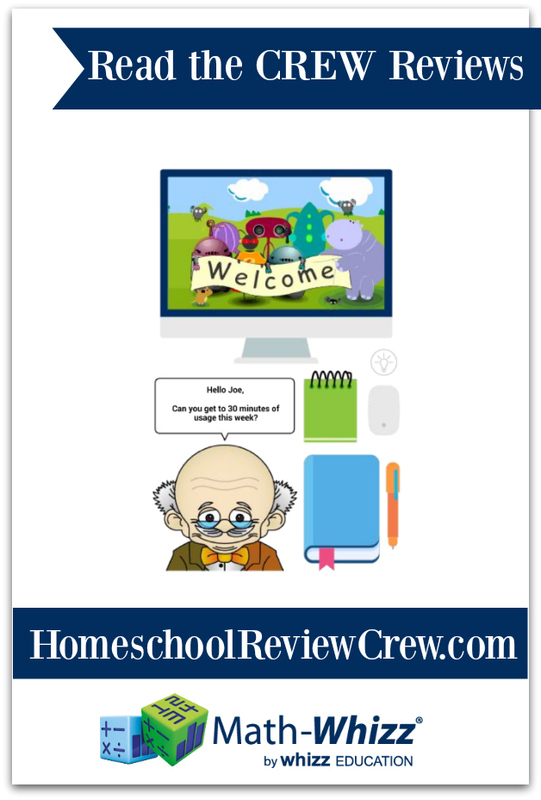 You can also find our more by clicking the banner below to read other reviews on this product from homeschooling families. Please also visit Math-Whizz on Facebook, Twitter, YouTube, and Google+.